All outings depart 17th & K Streets at 8:00 am sharp unless otherwise noted. In the description VA indicates suburban pickup in Virginia while MD means suburban pickup in Maryland (see maps of pickup points). Hikes marked MD & VA will pick up at both suburban locations. Hikers should be at suburban pickup points by 8:20 am. You don't need be a WB member to join us on a hike! 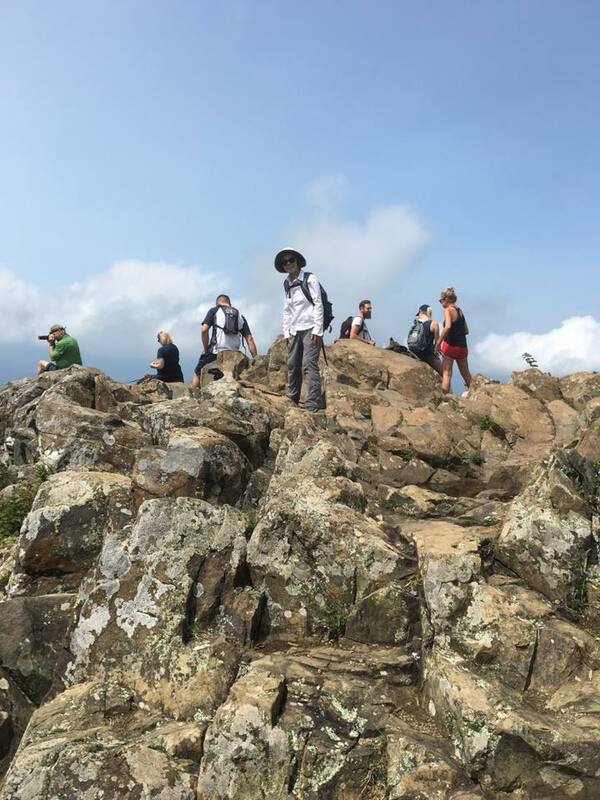 First time hikers please call a leader at one of the telephone numbers listed at the end of the hike description. All otheres can reserve by email or phone. It is club policy that hikers new to the club will take the moderate hike. If you sign up for a hike, don't be a no-show! (click here for no-show policy). Please try to sign up before 4:00 pm Friday afternoon before the hike! Otherwise the hike may be cancelled due to low number of sign-ups. And PLEASE don't call leaders after 9:00 PM! The distance and the elevation of the hikes are estimates. Antietam was one of the most decisive battles of the Civil War and also the bloodiest as more men were killed or wounded than on any other day inUS military history. Our hike today will cover the major confrontations during the battle on September 17, 1862. Both long and moderate hikes are flexible as to distance with no major elevation gain. The major trails cover over 12 miles and include major attacks and defenses by Union and Confederate soldiers, such as Bloody Lane and the Burnside Bridge. Est. : 10 and 8 miles, minimal elevation. NPS Map. Fare: $20/$25. There are literally acresof Virginia Bluebells on the banks of Bull Run, the result of rich, seasonally-flooded, sandy soil. If the season’s timing cooperates, we will see vast stands of these flowers in full bloom. Trout lilies, beavers, heron, kingfishers and migratory warblers also vie for attention. Moderate hikers start at Hemlock Overlook and proceed north (upstream) on the Bull Run-Occoquan Trail to Bull Run Regional Park. Long hikers start hiking north from Bull Run Marina; extra-long hikers start at Fountainhead Regional Park. Est. : 8 miles, 500’ elevation; 12 miles, 900’ elevation; and 18 miles, 3000’ elevation. Bull Run- Occoquan Trail Map. Fare: $20/$25. This hike takes us to Richmond, the one-time capital of the Confederacy, for a scenic and educational walk along the north and south shores of the James River. All hikers begin in the historic north district of the city, follow the elevated Pipeline Trail walkway overlooking a heron rookery, then cross the river on a pedestrian bridge that leads to the Buttermilk Trail around Belle Island, site of a Civil War prison camp. The hike ends in Maymont Park, where long hikers will walk an additional loop. Est. : 10 and 7.5 miles, minimal elevation for both hikes. Fare: $20/$25. Big Schloss and Mill Mountain, GWNF, VA. All hikers walk past Woodstock Reservoir from route 749. Long hikers then follow Little Stony Creek Trail, the Tuscarora, and then Mill Mountain Trails. About 1 mile past Big Schloss Cutoff Trail, they turn left to go to Big Schloss (optional), and then returnto Mill Mountain Trail and go left to Wolf Gap Recreation Area. Moderate hikers also follow Little Stony Creek Trail, but go left at FR 92 and then right on Big Schloss Cutoff Trail. At the junction with Mill Mountain Trail, moderate hikers go left and follow the path of the long hikers. Est. (without side trip to the top of Big Schloss): 13 miles, 2900’ elevation and 7.5 miles, 1950’ elevation. PATC Map F. Fare $20/$25. Long hikers start at Manassas Gap, and follow the AT north past Manassas Gap Shelter and the junction with Verlin Smith Trail to continue on the AT to a point just south of Dicks Dome Shelter. Here they turn right and follow Verlin Smith Trail around Lake Thompson and to parking area #4 and the waiting bus. Moderate hikers begin at parking area #4 and complete a circuit by joining the path of the long hikers. Est. : 12 miles, 1600’ elevation and 9 miles, 1000’ elevation. PATC Map 8. Fare: $20/$25. This hike affords excellent views of the waterfalls in the canyon. All hikers will start at Crescent Rock Overlook. All hikers will then proceed south on the AT. Long hikers will take Cedar Run down to the White Oak Cedar Run link trail and bear left to access the White Oak Canyon trail where they will also bear left to climb all the way up to the AT. Long hikers will then proceed south on the AT back to the bus. Moderate hikers will bear left at Cedar Run and take the White Oak Canyon Fire Road to the White Oak Canyon trail where they will bear left and follow the path of the long hikers to the bus. Some hikers may wish to view some of the waterfalls by heading down the trail to the first waterfall. Est. : 11 miles, 2300’ elevation and 7-8 miles, 1200’-1850’ elevation. PATC Map 10. Fare: $20/$25. Starting from the Hunting Creek Lake parking area, all hikers will take the Old Misery Trail to the Cat Rock Trail, and then descendto the Visitor Center. From there they will pass Chimney Rock, Wolf Rock, and Thurmont Vista. 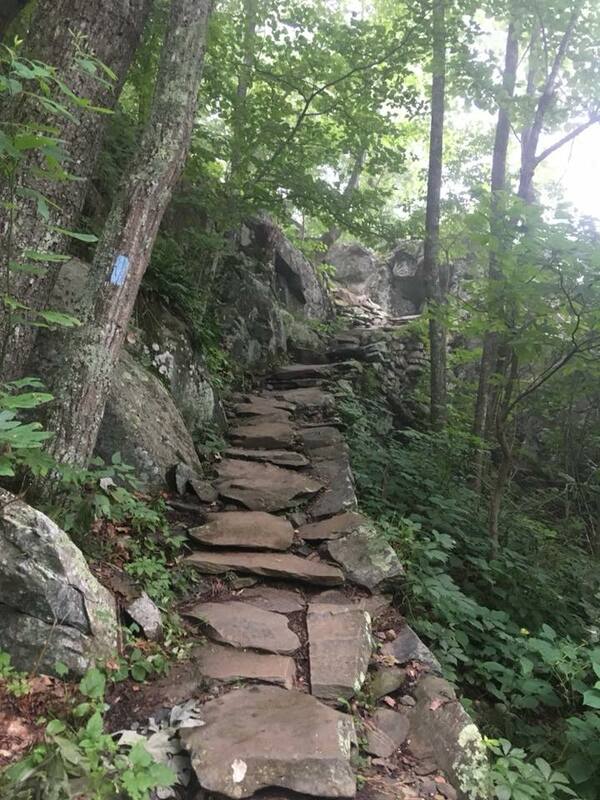 Moderate hikers will then descend via Hog Rock to Cunningham Falls and go briefly on Rte.77 to the Catoctin Trail, while long hikers will turn onto Park Central Road and arrive at the Catoctin Trail further north, then go south to the junction with Rte. 77. All hikers will take the Catoctin Trail to the Cat Rock Trail and go past Cat Rock to return to the parking area via the Old Misery Trail. Est. : 10 miles, 2000’ elevation and 8 miles, 1500’ elevation. Fare: $20/$25. Starting from Shures Landing, we will passa popular area for eagle sighting as we head downstream (south) on the Lower Susquehanna Heritage Greenways Trail. Then we’ll add a loop on the Deer Creek Trail before heading south on the Susquehanna Ridge Trail. Both hikes will do a loop before ending at the Rock Run Mill. Moderate hikers will take the Rock Run Trail and turn left on the Land of Promise Trail back to the mill. Long hikers will also take the Rock Run Trail, but turn right on the Land of Promise Trail and continue to the Susquehanna Ridge Trail’s north endpoint, using the latter to return to Rock Run Mill. Est. : 13 miles, 1400’ elevation and 9.5, 1000’ elevation. Susquehanna State Park Map. Fare: $20/$25. All hikers begin at Camp Roosevelt and climb Stephens Trail to Massanutten Trail. Here, long hikers turn left to do an out-and-back toward Habron Gap and then join the route of the moderate hikers. Moderate hikers turn right to ascend Kennedy Peak Trail and then return to Massanutten Trail, which they follow to Camp Roosevelt. Est. : up to 14.5 miles, 1700’ elevation and 9 miles, 1300’ elevation. PATC Map G. Fare: $20/$25. This hike passes several sites of Civil War skirmishes that led to the climatic Antietam Battle. It also traverses Lamb’s Knoll, Maryland’s second highest mountain. Moderate hikers start at Gathland State Park and hike north on the Appalachian Trail to Turners Gap (Route 40). Long hikers start at Weverton Cliffs, follow the AT north past Gathland to Turners Gap (Route 40). Est. : 14 miles, 2200’ elevation and 7.5 miles, 1000’ elevation. PATC Map 5-6. Fare: $20/25. This hike has outstanding views of the Trout Run Valley and Wilson Cove. Both hikes start from Trout Run Valley Road and will do circuits on Halfmoon Mountain. Long hikers take the Bucktail Trail to the Capon Trail, go along Waites Run Road, and ascendthe German Wilson and Halfmoon Trails to reach the Halfmoon Lookout to enjoy the views and watch hawks. They then descend on the Halfmoon and Bucktail Cutoff Trails to reach the Trout Run Valley Road and the bus. Moderate hikers follow the Bucktail Trail, ascend the German Wilson Trail, and continue on the path of the long hikers. (This includes the spectacular Halfmoon Lookout). Est. : 13 miles, 2500’ elevation and 10 miles, 2100’ elevation. PATC Map F. Fare: $20/$25. Both hikes are clockwise loops. All hikers start at Browns Gap and go north on the AT. After a short distance, long hikers turn left to complete Big Run Loop. Moderate hikers continue on the AT to Big Run Overlook, where they are rejoined by the long hikers. All hikers turn right to descend Doyle River Trail and then ascend Jones Run Trail. At the AT, they turn right to return to Browns Gap, completing the loops. Est. : 11 miles, 2800’ elevation and 8.5 miles, 1800’ elevation. PATC map 11. Fare: $20/$25 plus park fee or pass. The moderate hikers will start at the picnic shelter and take the Allen Mountain and Point trails then head back to the picnic shelter. The long hikers will do a loop consisting of these trails: Hemlock, Overlook, Campground, Culler, Bear Bottom, Big Oak, Redtail, Big Oak, Culler, River, Bluebell. Est. : 9 miles, 1200’ elevation and 6.5 miles, 1200’ eleva- tion. Shenandoah River Park map. Fare: $20/$25.